The deeply-carved stars in the blade radiate the infinitude of this asteroid sculpture. The futuristic design springs from the fertile mind of Reverdy. Speak of creativity: Reverdy is one of only 25 of the worldâ€™s top makers invited to the AKI Art Knife Invitational show every other year in San Diego. 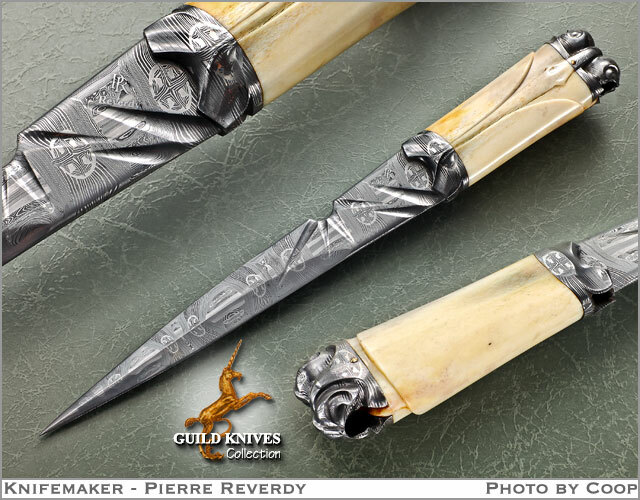 Pierre is unquestionably the number one knifemaker in France. Mosaic Damascus by him, of â€œAsteroidâ€ pattern. The blade is deeply carved differently on each side. Carved Damascus ferrule and pommel in the shape of asteroidal helmets. It comes with a Carved burl wood stand with 6 rare earthy magnets to hold the knife securely. Pretty spacey knife! Pouch/Sheath: Carved burl wood stand with 6 rare earthy magnets to hold knife securely. Condition: Reverse side of handle has minute craze.